The world is ending. What will replace it has yet to be determined. One of the things I like the most about zombies is how relentless they are. Other monsters can be outrun or outsmarted, but there’s almost nothing in the world that can stop these creatures. Mr. West’s version of them was particularly creepy because of how much time he took to describe the way their minds work. Those passages were really well done. I’ve read a lot of zombie fiction over the years. This was by far the scariest example of them that I’ve come across so far! I would have liked to see more character development in this book, especially when it came to Hunter. He made decisions during the course of the plot that I didn’t always understand. What I did manage to figure out about his personality was fascinating, but there simply wasn’t enough information about it for me to form an accurate mental image of what it would be like to be in the same room as him or how the Rapture changed his personality. The dialogue was short and efficient. Given the dangerous predicament they’d found themselves in, it made sense to me that Hunter and his friends wouldn’t be particularly interested in drawn-out discussions. I appreciated the fact that they showed their awareness of what was going on in part by choosing to stay quiet as much as they possibly could. It was a realistic response to their circumstances, and I liked that. 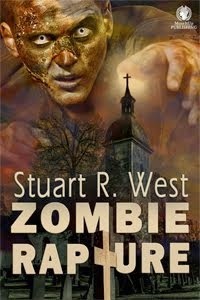 Zombie Rapture is a good choice for anyone in the mood for a fresh twist on this genre.